Compare Best Backpacks Diaper Bags: DadGear, Okkatots, Baby Sherpa or Skip Hop? You have just become a mom or a dad, or you are about to become one, and you are trying to figure out all the baby supplies you will need buy to take care of your baby in the best way. 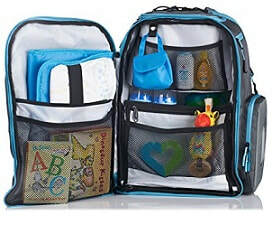 One very useful item becoming more and more popular that you might want to consider is the diaper backpack which allows you to take along all the necessary items needed for the baby when you go out together for a stroll or even a trip, without having to tie up your hands by carrying any of the stuff. These backpacks were made for parents who don't want to say goodbye to their outdoorsy lifestyles after the baby's arrival! But there are dozens of diaper backpack brands and models. How do you buy the best diaper backpack that will respond in the best way to your needs? This review will provide you with a list of important points to consider before buying the best diaper backpack for your needs and will present four carefully selected popular models that satisfy most of these points. What to Look for when Choosing a Diaper Backpack? Ease of Organization: The ideal diaper backpack will have enough room to carry absolutely everything for your baby, and still stay conveniently organized. It will contain a cushioned diaper changing pad, space for at least a dozen diapers, a removable wipe dispenser, insulated pockets for bottles, additional pockets and compartments for other items such as foods, cups, toys, keys, books, etc. Some fancier models even come with padded protected pouches that can securely hold electronic equipments such as an iPad or a DVD player. Convenience: The backpack should open up like a clam shell or like a book for maximum viewing and easy access to all compartments and pockets. It should have zippered side pockets that allow easy access to the main compartment while wearing. A removable and refillable wipe dispenser and a quick-grab wipes window are also desirable to facilitate reaching for wipes. The backpack should have straps that can attach to the handlebars of strollers. This feature comes in quite handy when you are out with a baby stroller, and you don't want to carry the pack on your shoulders. Comfort: The shoulder straps should be padded to make carrying the backpack comfortable. They should also be adjustable so you can move the pack up and down your back until it feels right. The backpack should also have a solid back support that strengthens the pack and stops it from bulging into your back when stuffed to the max, as this can be quite uncomfortable. Safety: Insulated pockets for the bottles is a must to avoid spoiling of the various baby foods. Fancier backpacks even have built-in coolers for medication, beverages, and snacks. A good backpack should be made from solid nylon or polyester for durability and protection against wear and tear. It should be equipped for waterproofing, and if you have a tendency to leave things on the floor or the ground, it should have a sturdy bottom or metallic feet to keep the contents off the ground and away from dirt and bacteria. Style: Though you don't buy a diaper backpack to go to a fashion show, you want to get one that is esthetically pleasant to you, as you may have to live with it for quite a while, specially if you go on extended trips. Diaper backpack models come in many colors and styles, and you are sure to find one that will appeal to your taste. Clearly, while many of the requirements (such as the insulated bottle pockets or the padded straps) listed above are essential, others, like the special pouches for iPad and DVD, are simply a matter of personal needs and are not must-haves. You will find below four diaper backpacks carefully selected from four well known and respected manufacturers. They are the Dadgear, the Okkatots, the Baby Sherpa, and the Skip Hop Forma. These brands are known to offer models that provide most of the essential requirements listed above. What differentiates them from one another are the extra features that each provide. Depending on which extra features are more important to you, you should be able to choose the best diaper backpack for your needs. Note that at the time this article was written, Dadgear, Okkatots and Skip Hop Forma backpacks had received the best reviews from Amazon customers with an average rating of 4.5 stars out of 5 stars for each of them! Baby Sherpa had received 3.5 stars. The DadGear diaper backpack is one of the most popular. It comes with a rich list of features that makes organizing and finding all your baby's and personal items in the pack a breeze. Spacious main compartment opens like a clam shell for easy access to contents. All other sub-compartments are lined with light colored fabric to make things easy to find. Two bottle pockets accessible from the exterior can contain 2 bottles each. Two additional large zippered pockets and the various compartments make for efficient organization and finding stuff very easy. Integrated stroller straps attach to any style stroller and store neatly when not in use. An award winning quick-access wipes case equipped with a specially designed access window in the lower front of the bag. Special pocket (called the Diaper Hammock) to keep diapers clean and neat at the top of the pack. A soft, large and washable changing pad is included (Length: 21in x Width: 12in x Thickness: 1/8in). The exterior is made of polyester and nylon webbing used in combination with durable hardware and high quality zippers. The interior is made of polyester fabric. Dimensions: Height: 18" x Width: 12" x Depth: 10"
To buy this diaper backpack please click the Amazon image link. You will be offered many colors to choose from! This Okkatots diaper backpack has a roomy design able to carry everything needed by your baby but still stay conveniently organized and very functional. Pockets for for 2 laptops and 2 cell phones. Easy access to diaper wipes compartment. Comfortable shoulder straps and reinforced stroller straps. Insulated cooler on top of bag. It has a firm baseboard to help keep bag upright making it easier to store items neatly. Fully opens like a book to allow easy access to inner compartments. Fits under an airplane seat. It measures 17.5" high x 16.5" wide x 9.5" deep. To buy this diaper backpack please click the Amazon image link. You will be offered 2 colors to choose from. The Baby Sherpa diaper backpack comes with plenty of pockets, compartments, pouches (some removable) and clips. The main features over competitors are the insulated cooler at the base, the large insulated bottle holders, the padded pouches and the first-aid pocket. Well protected padded pouches for personal and electronic equipment such as cameras, PDAs, cell phones, sunglasses, iPads or DVD players. An over-sized extra well cushioned change pad. Various clips for keys, pacifiers and toys. An insulated bottle pocket and a water bottle holder. Ergonomically designed padded shoulder straps. It is offered in 3 colors. To buy this diaper backpack please click the Amazon image link shown here. You will be offered two colors to choose from. The Skip Hop Forma diaper backpack not only has great style, but it is also well organized and very functional. With lightweight fabric and stylish quilted detailing, this backpack provides parents with all the on-the-go and hands-free conveniences they will need. Extra large dual zip opening. Front section with two large storage cubes. Elasticized interior pockets and insulated side bottle pockets. Multipurpose mesh cube for diapers, clothing and snacks. Cushioned changing pad pocket that can also hold tablets and laptops up to 15". Dimensions: Height: 14" x Width: 8"x Depth: 16"
It is offered in two colors. Given the large space and features it provides, you will be able to use the Skip Hop Forma backpack, from birth to toddlerhood and beyond in style. To buy this diaper backpack please click the Amazon image link shown here. You will be offered three colors to choose from. The four diaper backpacks considered here have received excellent reviews from Amazon customers, and chances are you will be quite satisfied with any of them as far as the basic and essential features of a good diaper backpack are concerned. Though all four backpacks come with the essential features listed above, some have additional features that are not really must-haves, such as iPad and DVD pouches. Now that you have all the features and characteristics of the four diaper backpacks considered here, you should be able to make a choice based on your own needs, preferences and taste. You can buy the above diaper backpacks right here on Amazon. Please click the selected product to check the price or to purchase. Note also that when you click these backpacks you will be offered additional colors to choose from whenever available. ​Have you not found the yet the what you were looking for?